Before we look at the deterioration and repair of concrete it is important to have a brief overview of concrete. Concrete is a mix of 3 basic ingredients Portland cement, aggregates (both fine and course) and water which once dried and combined with steel it makes a very versatile construction material. If correctly designed, concrete structures will prove to be very strong and durable. Overtime however, a concrete structure can be susceptible to a number of factors that can cause deterioration which could lead to a reduction in strength making for unsafe conditions. Therefore it is essential that a concrete structure is maintained correctly. To do this it is necessary to have an understanding of the vulnerabilities of concrete structures to help minimize the long term repair and maintenance costs. Concrete itself has very good Compressive Strength, but very poor Tensile Strength (approximately 10% of its compressive strength). Compressive Strength is the capacity of a material to withstand axially directed pushing forces. The Tensile Strength is the amount of stretching stress a material can withstand before breaking. Steel however has very good Compressive and Tensile Strength it also has thermal properties that are compatible with concrete. Once combined structures can be created which are capable of supporting considerable loads. Due to the high alkalinity (pH) of concrete any embedded steel will be surrounded in an environment which limits corrosion and helps to assure the durability of the reinforced concrete member. The reinforcing bar itself should be approximately 50 – 75mm below the surface of the concrete to benefit long term from its environment, however it is not always easy to ensure this during construction and insufficient cover is a common occurrence. The closer the steel is to the surface the more likely it is to corrode. There are many things that can influence and cause concrete to deteriorate. However it typically occurs when the material is exposed to the weather, water or other chemicals over an extended period of time. If correctly constructed and protected from these elements the structure will last for decades with very few maintenance issues. However, in the real world, some sections of a concrete structure are exposed to many of these environments regularly, these include industrial structures, multi-storey car parks and balconies etc. Once deterioration has begun it can occur in the embedded steel as well as the surface of the concrete. 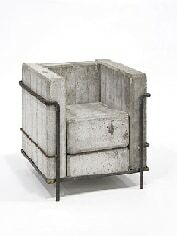 Concrete is a porous material which will allow carbon dioxide in the air to penetrate into the concrete via the pores. Due to the presence of calcium hydroxide and soluble alkalis in the concrete it gives the concrete a pH of around 12.5. Carbonation will occur when the carbon dioxide reacts with the calcium hydroxide which in turn lowers the pH of the concrete leaving it more vulnerable to deterioration. The carbonation process starts off at the surface and slowly penetrates into the concrete through the air filled pores. However, If the concrete is fully submerged below water carbonation will not occur. Once the carbonation process begins the protective environment which once existed for the steel bar is reduced leaving it susceptible to corrosion if any moisture is present. Chlorides may be introduced into concrete from a variety of different sources. For instance – natural aggregates and water that was used in the mixing of the concrete may have contained chlorides. Chloride ions are also present in road salt and if allowed they will penetrate into the concrete via the pores. While carbonation requires air filled pores for it to penetrate, chloride requires water in the pores and penetrates via diffusion through the partially filled pores into the concrete. In the areas where chlorides are present accelerated corrosion of steel reinforcing bars can occur. It has only been in recent years that the addition of chloride has been discouraged in reinforced concrete. Calcium chloride was first used as a set accelerator in the late 1980s usually during the winter months but now it is been discouraged due to its accelerating effect on the corrosion of the reinforcing steel. This can occur to concrete which is exposed to both wet and freezing conditions. If any water is present within the concrete which subsequently freezes an outward pressure on the surrounding material is created. Freeze / thaw generally occurs in two forms. The first form is where water collects on top of a horizontal surface of concrete. The freeze thaw cycle occurs on the top surface of the concrete causing it to deteriorate and subsequently begins to work through the concrete exposing the aggregates, leaving the concrete more porous which in turn promotes further deterioration. 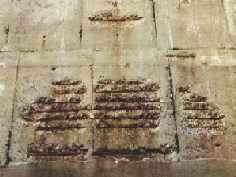 The second form is where larger amounts of water enter and collect in any cracks rather than the pores of the concrete. This results in damage which can be more severe over a shorter period of time. This could also lead to saturation and deterioration of the reinforcement steel. ASR and DEF are both chemical reactions caused by the properties in the aggregates and cement. DEF is sometimes known as internal sulphate attack. All the above reactions are catalyzed by moisture, and gradually progress into the concrete as surface cracking allows deeper water penetration. 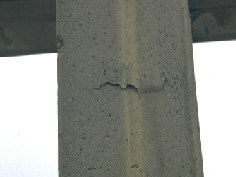 Distress of the concrete can also be caused by overloading or under design of a structural member causing warning signs to appear in the form of excess deflection or critically configured cracks. Fire can cause severe concrete damage because of shock heating. Shock heating causes the outer surface of the concrete to expand much more quickly than the inner portion causing it to fracture and break away. A reverse situation can also occur when the surface of hot concrete is cooled quickly via a fire hose or sprinkler system, causing the outer layer to shrink and break away. Lightning can also cause damage to concrete by differential thermal heating. This is caused when extreme concentrations of electrical voltage are forced through concrete. Concrete will conduct electricity but heats up as the energy is emitted as heat. The lightning will make its way to the embedded reinforcing steel and won’t stop until it reaches ground. Due to the steel being an excellent conductor, the voltage tends to transmit through the reinforcing cage, but will arc through concrete at discontinuities. Consequently, an electrically continuous reinforcing cage minimizes damage. At discontinuities, explosive spalls are likely to occur. Also, if reinforcing steel is heated sufficiently, it will expand and may crack the surrounding concrete. An inspection of the defective areas of concrete should be carried out before a specification or any remedial treatments are undertaken. The inspection may require testing which will be accompanied by laboratory material studies. 1. 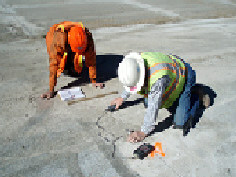 A visual inspection, looking at the condition and any defects found in the concrete, is the first step. Attention should also paid to the structural system and any modifications to the structure, it’s current and intended use, typical and anomalous conditions and a brief survey of the structure’s environment. Structural drawings should be included as part of the inspection, if available. All observations should be recorded. 2. 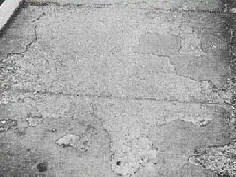 To evaluate near-surface concrete deterioration, this can be carried out by tapping the surface with a metal hammer or plastic mallet. With good concrete a relatively high-pitched sound is emitted. However, concrete with sub-surface deterioration produces a distinctly lower-pitched, “hollow” sound. This low-tech method can be an effective means of evaluating the extent of sub-surface concrete deterioration. If the concrete is covered and an inspection is not possible then access should be made by removing the covering material. 3. It may also be necessary to determine the size and configuration of the embedded reinforcing steel. This can usually be carried out with a combination of exposure works being carried out around any defective areas, with the use of specialized metal detectors or using other ground-penetrating radar and X-ray technology. electrical circuit that can be connected to reinforcing steel at regular intervals, usually on a grid. The electrical potential (voltage) is then measured at the grid points. A high potential correlates to a high risk of corrosion. Half-cell testing is an effective means of identifying parts of a structure most vulnerable to steel corrosion. 5. 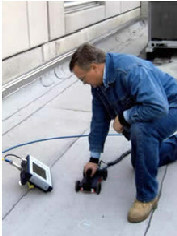 Sample testing can be an important part of any inspection. A range of testing methods are available to complement the information gathered on site. If a full investigation is required to a concrete structure the extraction of core samples will be required. Tests can then be carried out on the sample which could include compressive strength, depth of carbonation and chloride content. Other tests could include microscopic (or petrographic) and chemical studies to evaluate specimen composition and condition in detail. A well-designed testing regimen is an important tool for the development of appropriate repair recommendations. By carrying out these tests can highlight areas of structural concern, and if necessary. In such cases, a structural analysis may be required to evaluate the need for strengthening of the affected members. Once the inspection and any tests have been carried out and the information has been collated, only then can an effective repair or maintenance plan be specified. 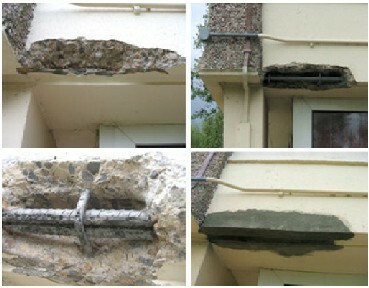 It’s important to note the difference between concrete repair and the protection of concrete from future deterioration. Concrete repair techniques over the past few years have been increasingly standardized. Concrete repair generally involves removing the deteriorated concrete, cleaning and preparing the defective area and the exposed reinforcing steel, after which rebuilding up the defective area using a suitable repair mortar. To ensure a sound repair, the repair cavity needs to be carefully shaped and prepared and the repair material must be carefully selected, placed and allowed to cure. Repair documents should include both drawings and written specifications and procedures. Once any concrete has been repaired it is very important to protect the structure from future deterioration by applying a protection coat. Protection coats almost always involves applying a material that will limit the amount of moisture that is able to come into contact with the surface of the concrete, by carrying out improvements to the drainage of the concrete or surrounding areas may also prove beneficial to the longevity of the concrete. But beware improper coating application can actually increase deterioration by trapping moisture inside of the concrete. The images to the left show the damaged concrete prior to the concrete repair and the exposed reinforcement bar that has been grit blasted and is now ready for stage 2 of the concrete repair process. We can also see in close up the exposed reinforcement bar following grit blasting. The grit blasting is necessary as it removes any oxidation prior to the concrete repair taking place. 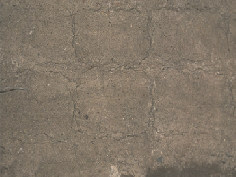 The concrete repair medium is then hand applied in layers to build up a strong concrete repair. This 2 part concrete repair system is a “Complete” concrete protection system that protects against carbonation and requires no bonding or protection coat. The finished concrete repair can then be painted within 48 hours. In addition to repair and protection, some structures or sections of concrete may require strengthening or waterproofing of the concrete itself. A variety of materials and systems are available for both strengthening and waterproofing almost any structural concrete component. To strengthen a supplemental steel concrete other elements are often employed. Other materials used include carbon fibre sheets and glass fibre reinforced plastic (GLRP) structural members. Areas of concrete can also be injected using Injection Technology which involves filling any cracks, fractures and even the pores of the concrete and subsequently bonding the concrete together and giving it additional strength. The injection materials will usually have waterproof qualities with the end result being the concrete is both strengthened and waterproofed. We just had a new concrete patio put in. The coloring was supposed to be a medium dark red tone. But when it dried it came out light pink with numerous white blotches. However, the proper color comes up when the surface is wet after a rain. Therefore, to correct the problem the contractor wants to wet the surface and then apply a sealer. Would that be a proper permanent solution?